There are so many wonderful bakers out there and I can’t say I am one of them. I’m more of a fly by the seat of your pants person in the kitchen. I have good instincts from being trained by lots of stern French chefs but I can’t say I have ever been a masterful pastry maker, simply because it requires much too much precision and patience. 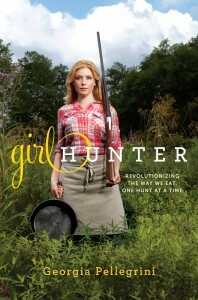 And I just shrug it off as if working all day on a painstaking tart was just part of my style. NOT. But really, this tart will make you look like a pro and it is so very simple to make. 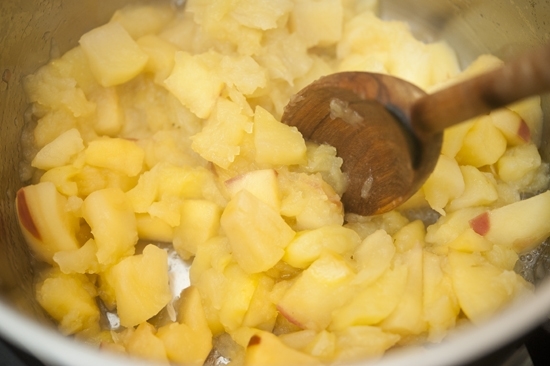 You’ll need very little for the filling: stewing apples like golden delicious for the compote, and firmer apples like gala for the top. 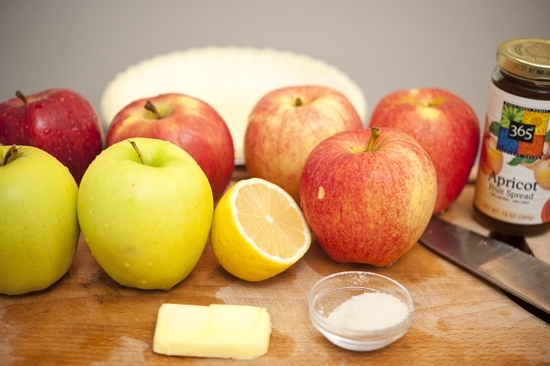 For some tips on the different apples check out this post. 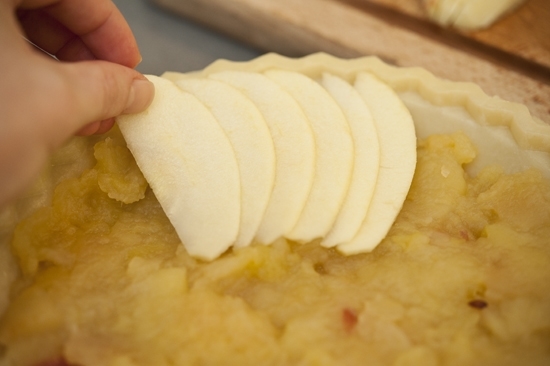 For the tart shell you can buy one pre-made, or you can make this super simple tart dough. 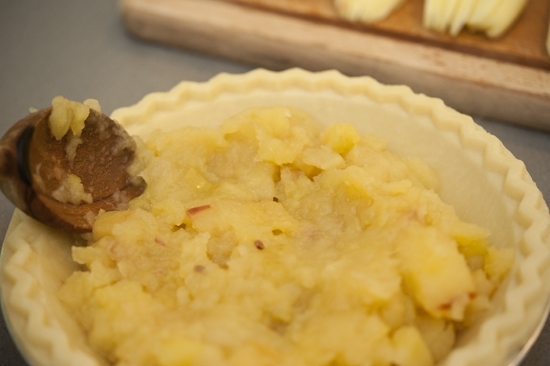 You can even make it in advance and have it waiting in the freezer for a last minute tart. 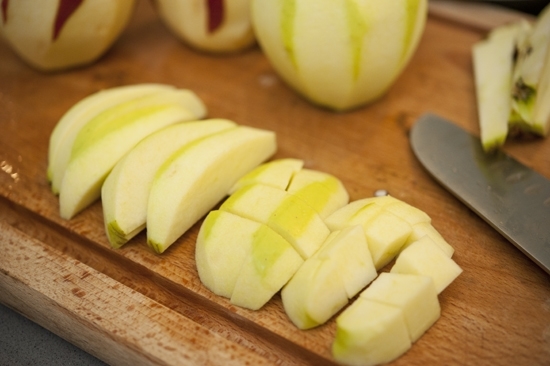 You start with the filling by peeling 4-5 apples. I like to leave some of the skin on to be subversive. Plus it adds a nice texture. Then cut the core off each wedge. 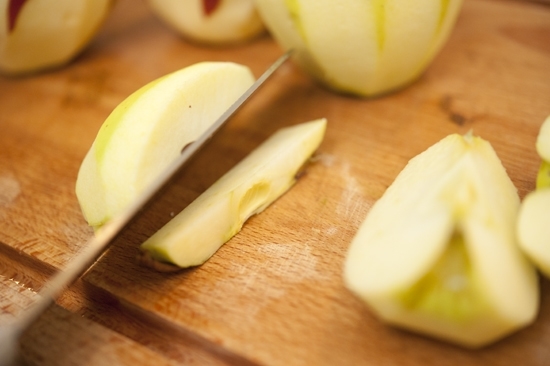 If you want to be efficient about it you can use an apple corer. 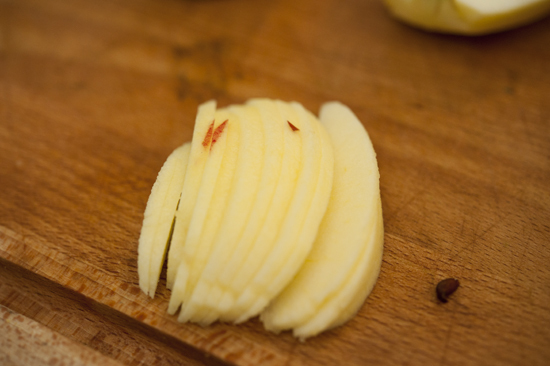 Cut the wedges into 1/2-inch pieces. 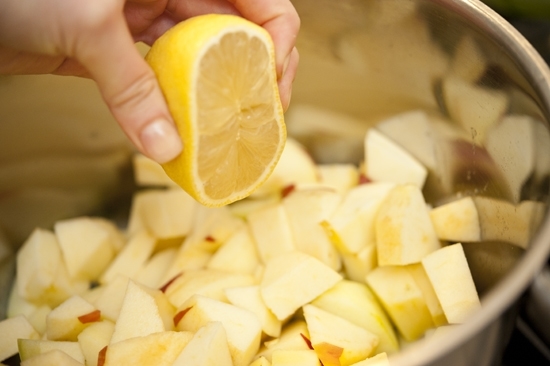 Next put all of the pieces into a pot and squeeze a bit of lemon juice in there to keep them a nice light color and to add a little tartness. 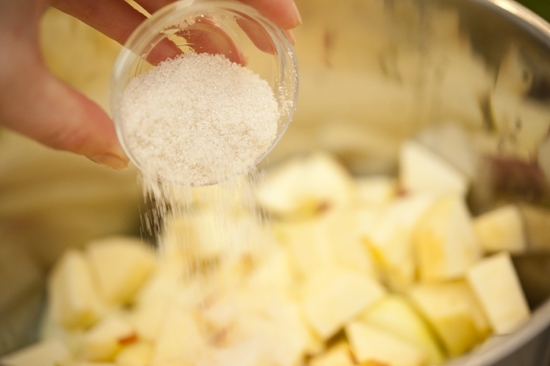 You can also throw in a bit of raw or regular sugar if your apples aren’t super sweet. A dash of water will also help them steam once they’re covered. 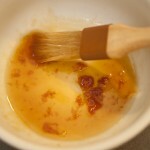 Give them a good stir and let them cook on low heat covered for about 20 minutes. 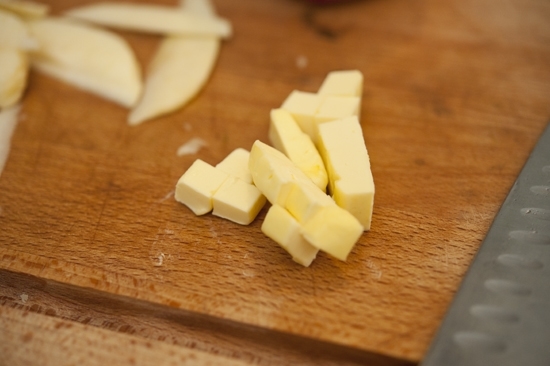 You’ll know they’re ready when the pieces can easily be broken apart with a spoon. 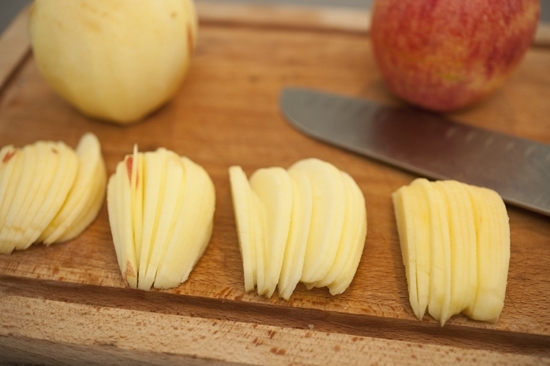 You still want them to have some shape, not complete mush like apple sauce. 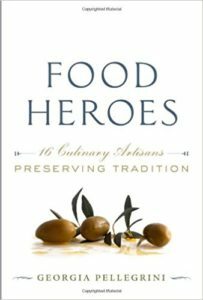 While they are stewing, you can get your top ready. 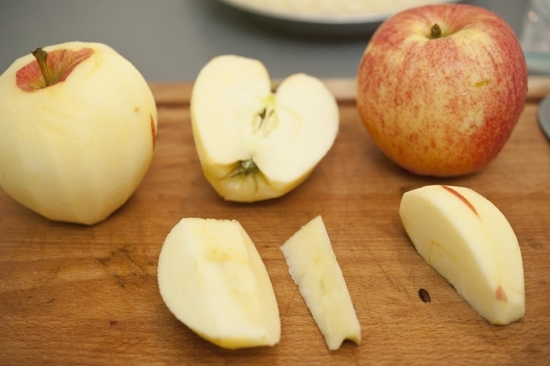 This entails peeling and removing the core from 2-3 more apples. 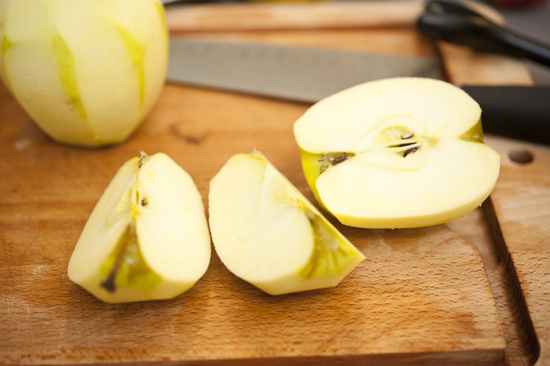 You’re going to slice them as thinly as possible now, making sure so save some of the smaller sides of the apple for paper thin slices which will serve as the center of the tart… you’ll see! 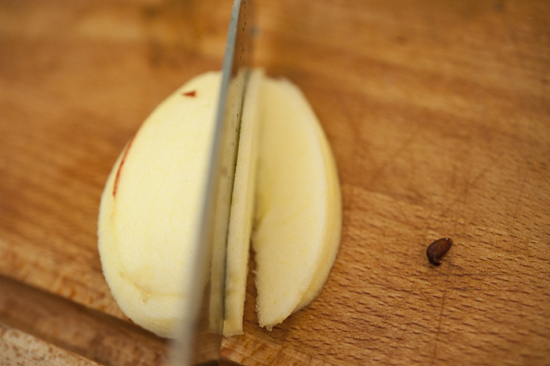 This is how thinly you’ll slice the apples. 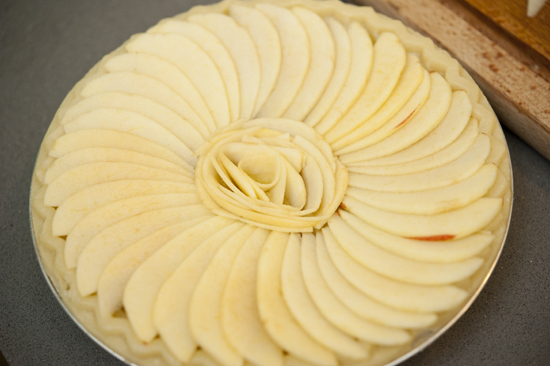 Have your slices all lined up and ready to go. 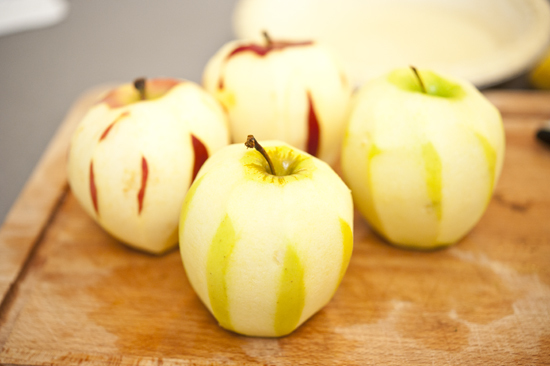 You can even squeeze them with some lemon juice if they start to oxidize and turn brown. 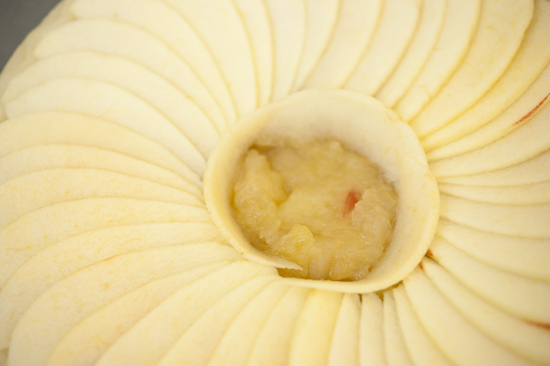 Let the apple compote cool slightly, then distribute it evenly into the tart shell. 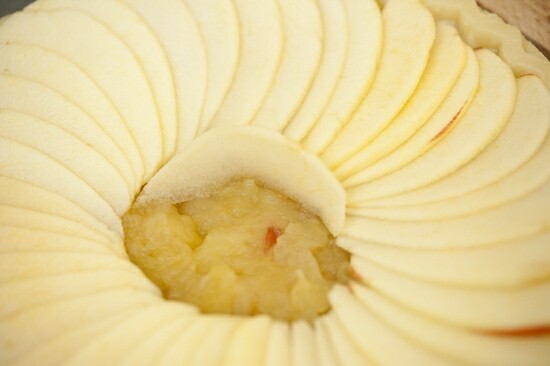 Begin to layer the apple slices in overlapping layers around the shell, making sure not to leave any spaces where the compote peeks through. 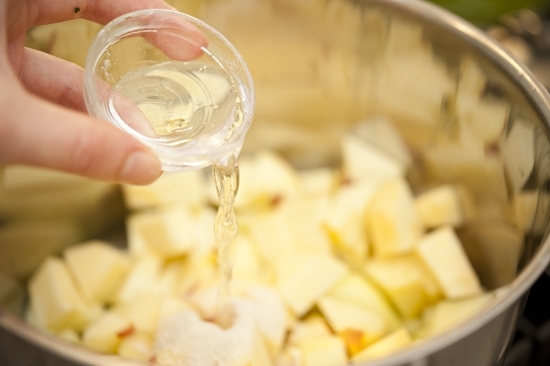 The apples will shrink so you want to be generous with them. Keep going around and around. The very last piece you’ll tuck under the very first piece. When you’ve come to the end it will look like this! Next comes the center rosette which requires some thinner slices that can be bent slightly. 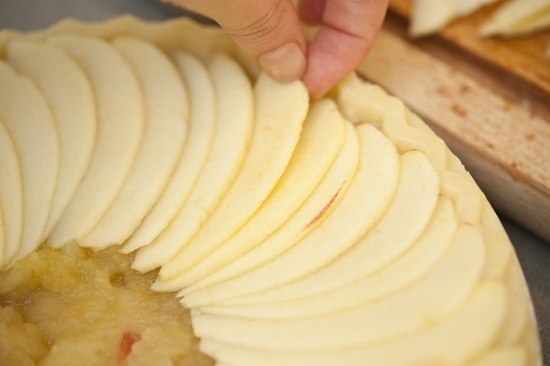 You’ll bend a few slices and tuck them into the compote to create a round outline. 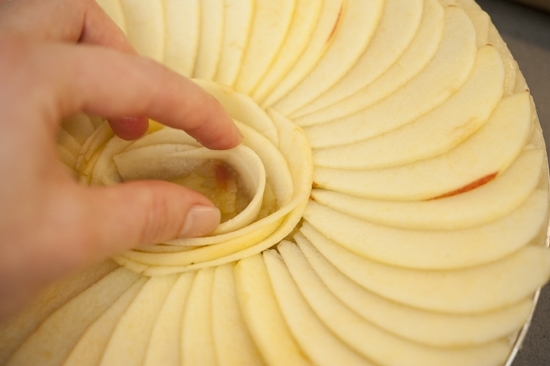 Then you’ll repeat with more thin slices and overlap them until you’ve completely filled up the center. It will look like this when you’re done! And dot it all over the tart. 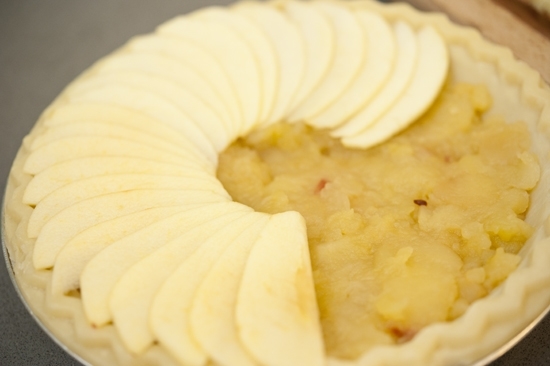 Pop it in the oven for 50-60 minutes until it is golden brown on top and the crust as golden brown too. 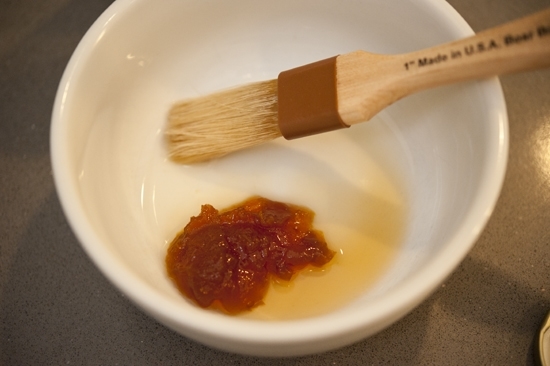 Once you take the tart out of the oven, you’ll mix some apricot jam with water and put it in the microwave for about 60 seconds. 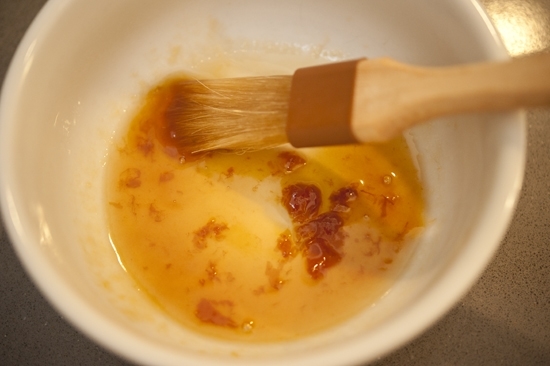 You want to mix it well so you have a thin glaze. 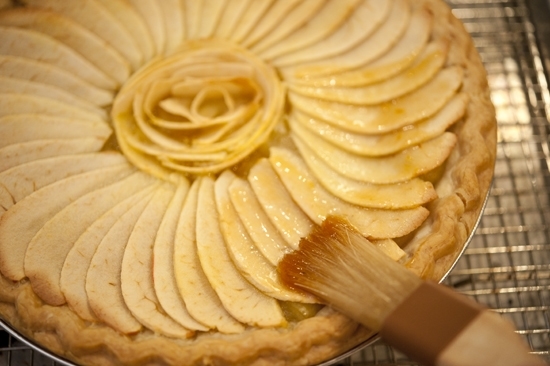 Paint it gently over the tart slices and let it cool. In the end, you will have this! Now like I said, I’m not patient, so I’m sure yours could be much more beautiful and precise. You could even play around with the design. 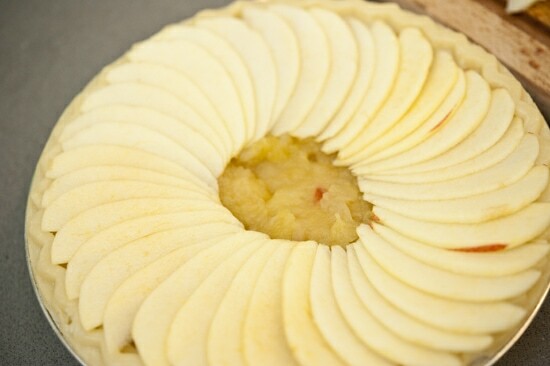 In fact when I was cooking in France we made one with the round side of the apple slices facing toward the outer crust and overlapped them in a scalloped edge design. 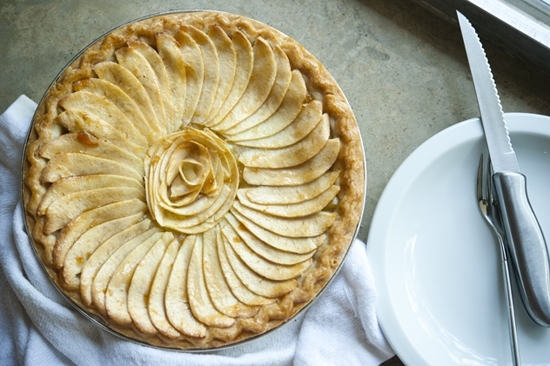 This tart is wonderful at room temperature after things set a bit. And because in true French style it has very little added sugar, it is also wonderful for breakfast. Or how about with a slice of cheddar cheese? Give this a try! Cross my heart you’ll love it. 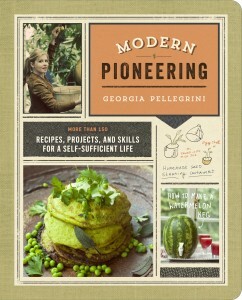 Just made this exactly as stated and it is a hit! I don’t feel guilty giving it to the kids because, like you said, it is so fruit-heavy. Perfection! Hurray! 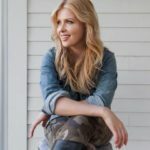 So glad it worked out for ya Holly! 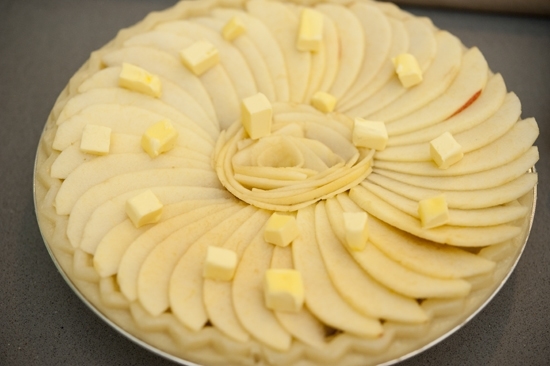 If I’m using your recipe for the tart shell you linked, do I need to pre-bake it for this recipe as well?